Potting up: usually an act of mercy when a plant is threatening to blow up its pot, making it necessary to move the overgrown plant to a bigger container. 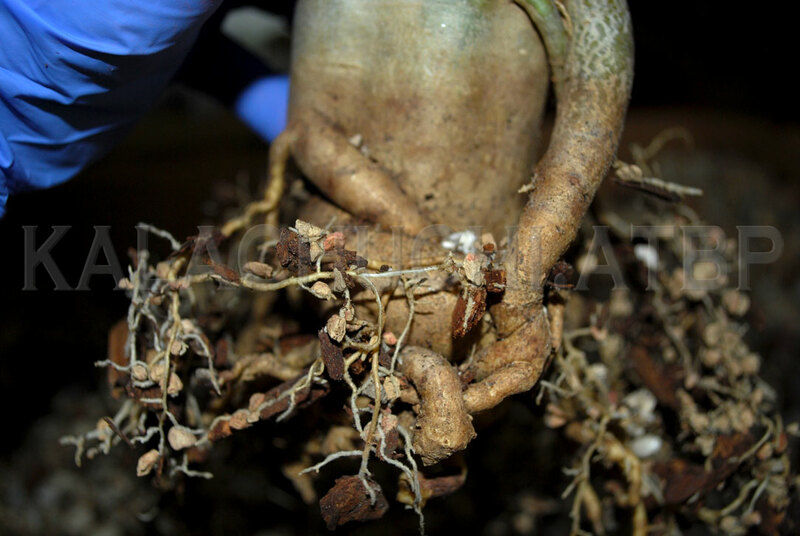 Potting down: moving an over-potted plant to a smaller container, usually done as an emergency procedure. A pot is likely dying by the time you realize its pot is too big and therefore staying wet too long. 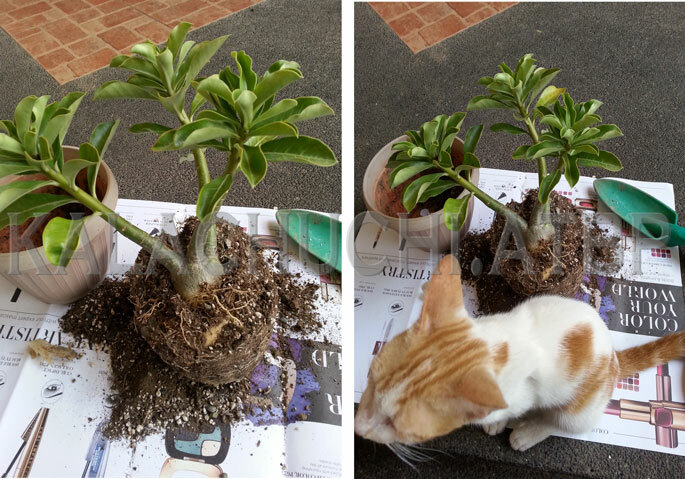 Repotting: unpotting, cleaning and repotting a plant in the same pot with fresh soil or substrate. Or moving a plant to a different pot of similar size just because you're sick of the way it looked in the old one. Adeniums (probably most, if not all, potted plants) have to be refreshed every year or so, even if they do not need to be potted up. How often to do this is entirely up to you. Some people leave their plants alone for long stretches of five years or so. Routine repotting is normally done in the spring, just before the plants go outside when it is warm enough. 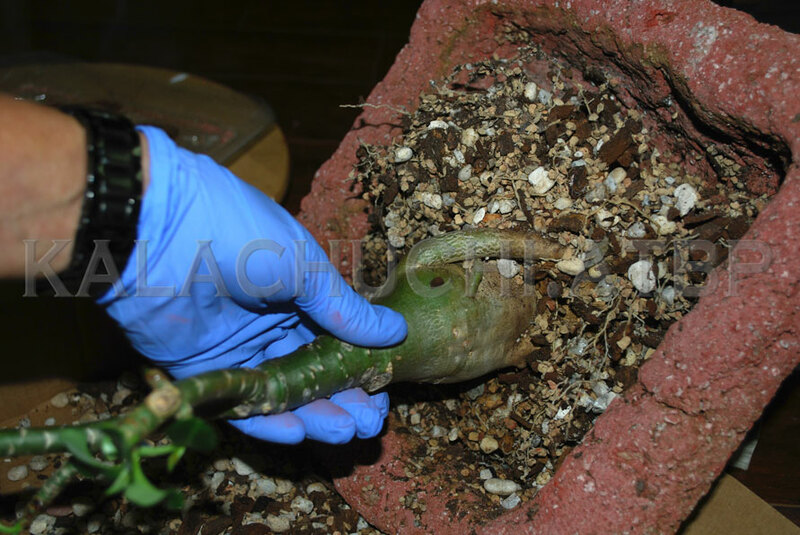 This is usually the time when you want to inspect your plants and decide whether it has grown sufficiently in the previous season that you can finally raise it to expose the growing caudex underneath. Clean pot--if you are putting your plant in the same pot, clean it up before you put the plant back in. Brush the old dirt off under running water and give it a rinse. No need to be obsessive. Screening material, cut into pieces big enough to cover the drainage holes of your pot. If you are up to it, get a drill and a one-inch hole saw. It's dumb that pots only have one hole. They should have at least three. Nursery pots have a bazillion drainage holes but I don't like using them for adeniums growing in gritty mix. The sides are so flexible the substrate moves around a lot inside every time you move it. 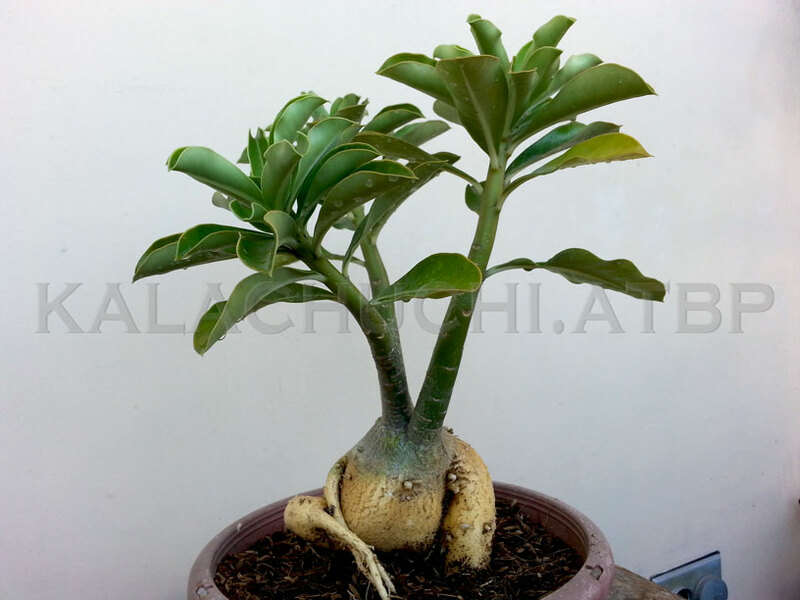 For this operation, we will work with my Rik Ni Ran, the first adenium I have ever had. It has been undisturbed in the same pot for two years and that substrate now needs to be refreshed. 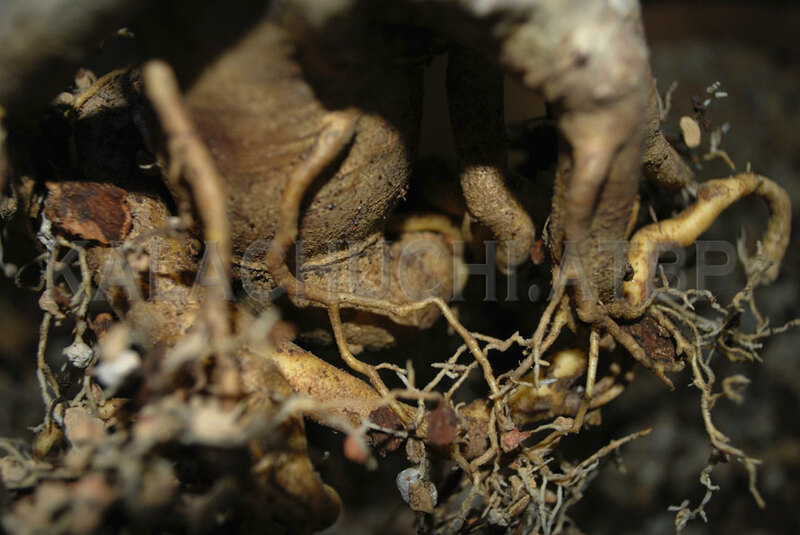 We also want to see if the roots and the caudex have grown enough to make it worth raising for the first time. First, turn the pot on its side and just allow the substrate to fall out slowly. One of the best things about the gritty mix is that it is reusable. So I collect it, wash and and put them somewhere flat where they can dry out in the sun, rained on and dry again. If your plant is in potting soil. wait a few days for it to dry out. When you tilt your pot this way, you will have to gently pry the dry soil out. Use a chopstick. When you have poured out as much as you can, gently tug at the plant. This one has been growing in the same pot for two years so some of the finer feeder roots are actually stuck to the pot. Just wiggle it a bit to dislodge it. And there we are. The screen covering the drainage holes are now stuck to the plant, with some roots growing through. I just cut those to remove the screen. Another way is to just run a hose and hose thing down. This will also work but you will need to control the pressure because a high pressure wash can peel the skin off of those roots. If that happens, dry your plant out overnight before putting it back in the pot. The big chunk in the middle is the taproot. If this plant was growing in the ground, that thing will grow straight down as far as it can go. In the pot, however, it will contort to whatever shape it can twist into. But it will continue to grow bulkier. 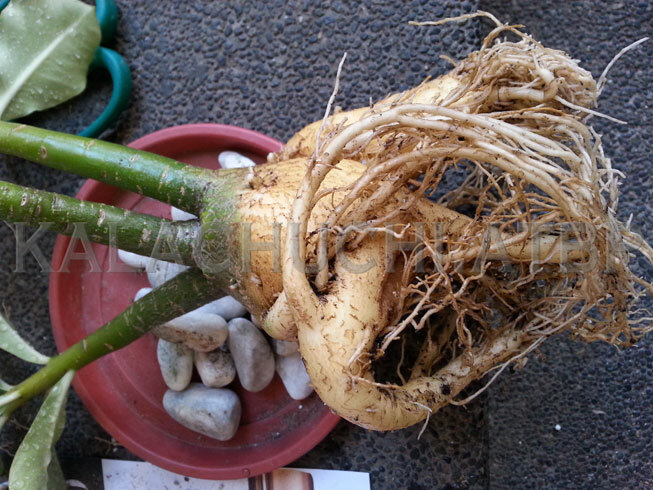 Constricted in the pot, the same chunk of taproot has twisted around, curving horizontally at the bottom of the pot. This is the sort of funk that I like most about adeniums. It's a little macabre--like foot binding among aristocrat women in ancient China. Fortunately, they are plants. Secondary roots also continue swelling up as you can see. If I raise this plant, the exposed part will harden and form part of the trunk. It will also stop growing. 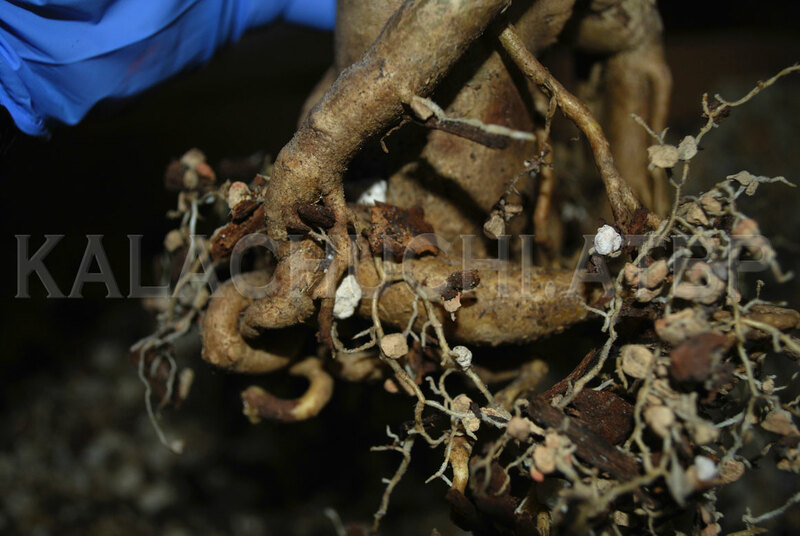 But these smaller roots are less than an inch in diameter--too small. I can't raise this plant this year after all. 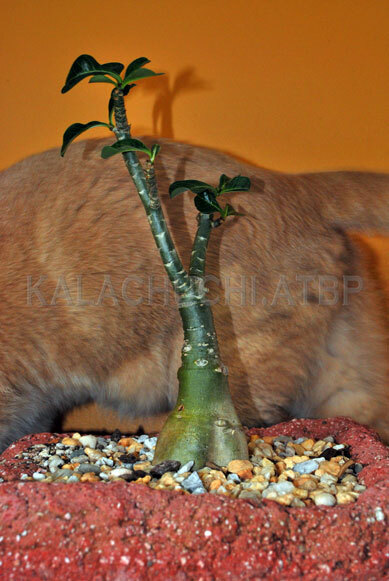 This plant is going to rock when those roots develop more girth.Look at all those twisting curls and swirly curves. Hopefully, one season will be enough. I plan to closely supervise the feeding and watering of this one to see how far I can push the growth. This also means holding back on branch-pruning. I do not want to disrupt it when it goes full swing this growing season. It is possible I will not allow it to bloom. In the tropics, things happen a little faster. This plant below is a seedling, i.e. it is less than a year old. A seedling! Grr. See the ridiculous amount of roots in this thing? This is what you get in a consistently warm and sunny climate and you get it in six months from seeds. The sheer mass of the rootball explains the large, lush leaves and the thick branches with very short spaces between the leaves (internodes). This means that these branches will be perfectly capable of supporting the weight of inflorescence which, in adeniums, are actually quite heavy. It is often better to dry out the plant for a few days before unpotting them. This way, the dirt just falls out and you can just give it a shake to remove the old soil. You must always remove every bit of old potting soil. 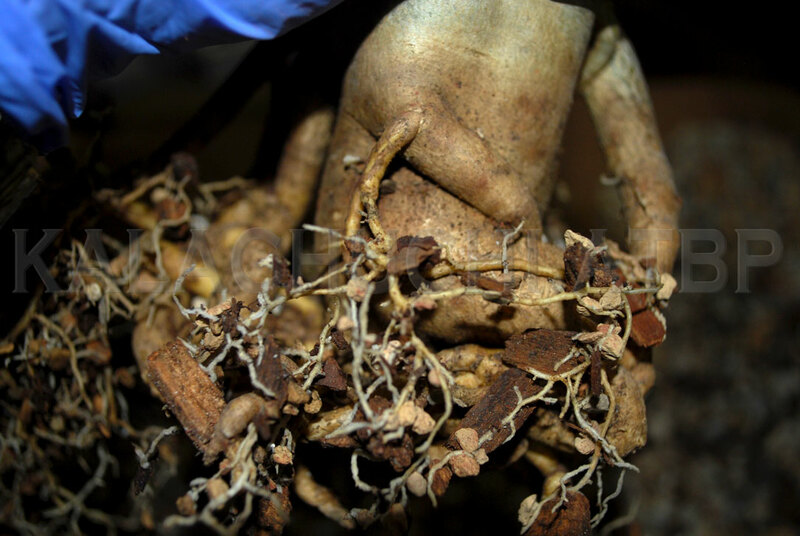 The old potting soil stuck to the roots will absorb and retain water at a different rate than the fresh soil around it. 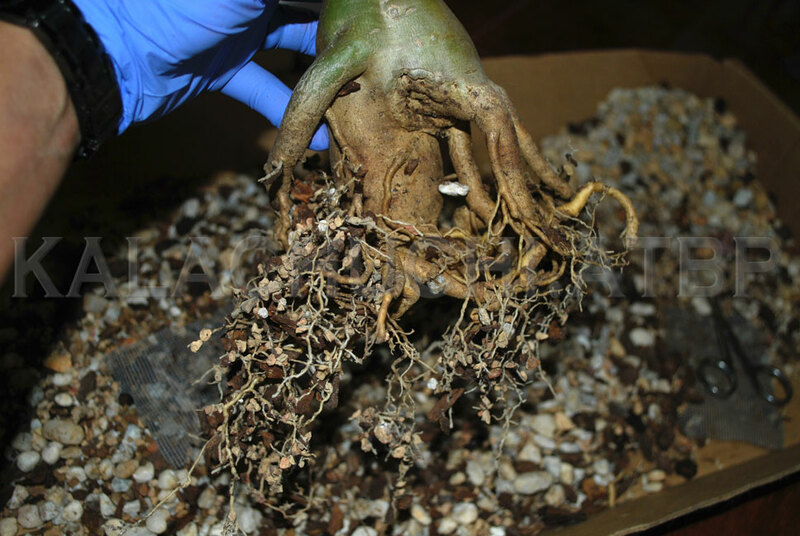 So if you want to keep the moisture even in the pot and prevent root rot, clean out the roots as thoroughly as you can. 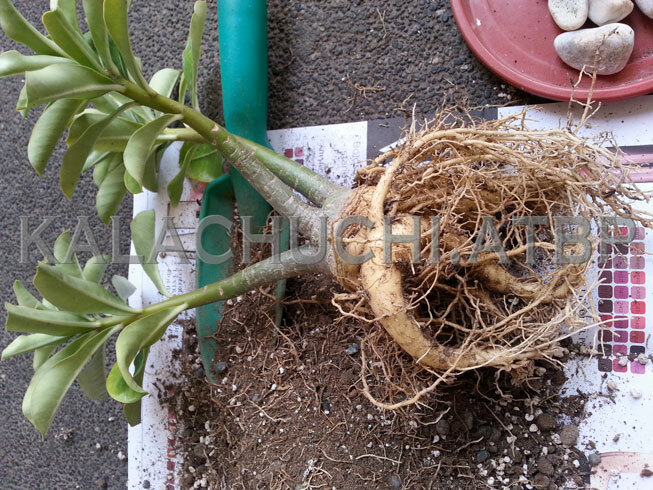 Because of the size of this plant's rootball, it was potted up instead of just getting fresh soil. It clearly needs more room to get even bigger before taking over the planet. 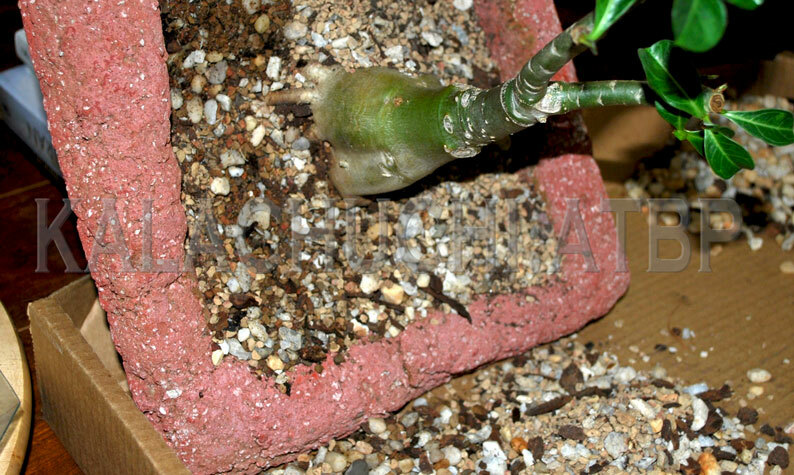 It is usually prudent to wait a couple of days before watering a repotted adenium, if you are feeling paranoid. We dont. We just water them right up. Some people also go through extra rituals like treating the roots with rooting powder or fungicide or blood from blind baby buffalos born during the full moon. You can do those, but you will find it is largely unnecessary. Heat and sun is really the only thing these things need. In an emergency you can repot in the depth of winter but if it's just routine repotting, wait for it to get warm.